A. C. Gilbert published an entire line of books and kits for boys to do science experiments as well as magic. This title deals with liquids, smoke, fire and chemicals. Here’s real fun! Tricks with chemicals which will mystify and amuse your friends! Gilbert’s Chemical Magic is a new idea in conjuring. 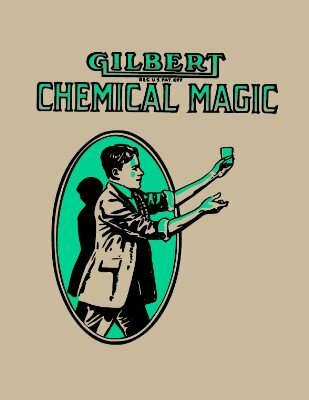 We have our Gilbert’s Tricks with Coins, with Handkerchiefs, with Cards, the Miscellaneous Magic Tricks, and now we have Tricks with Chemicals. There is really double fun in Chemical Magic because, besides being very mystifying to those who are uninitiated, you are given the chemical explanation of what takes place, so that you will actually learn quite a little about chemistry. Many of the tricks we describe here have been performed by some of the best spirit mediums, who have not only mystified but convinced people that the tricks were accomplished with the aid of the spirits or by means of some superhuman power. We explain how they are performed by purely natural means. The real fun lies in knowing how to do them and in mystifying your friends. There is no danger to be feared in using the various chemicals necessary for the presentation of the tricks described in the following pages. However, you are cautioned not to attempt any combinations with the chemicals other than the ones given, and to follow directions closely. 1st edition 1920; 65 pages.